Editor’s Note: At the time that this story was published in 2005, scientists presented the science as they understood it. But Earth is constantly changing, and scientific knowledge is constantly evolving with longer perspective. A decade later, the CERES record has been extended and further analyzed. Read an updated story here. On average, the Sun shines on Earth 341 watts of energy per square meter of surface area. The Sun beams more energy to our planet every hour than humanity uses in a whole year. This energy provides the fuel needed to support most of our world’s life forms, and it keeps our world warm enough to sustain them. Sunlight also provides the energy that powers Earth’s climate system. 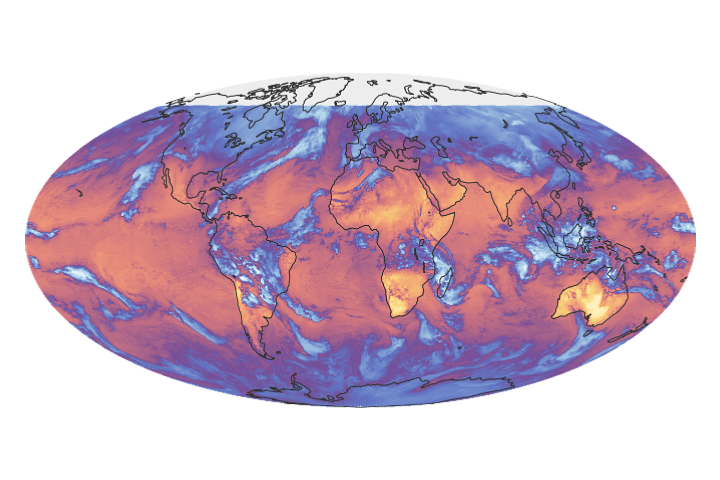 The image above shows Earth’s average albedo for March 2005, measured by the Clouds and Earth’s Radiant Energy System (CERES) instrument aboard NASA’s Terra satellite. Albedo is the fraction of incoming sunlight that our planet reflects back to space. If Earth was covered in ice like a giant snowball, its albedo would be about 0.84, meaning it would reflect most (84 percent) of the sunlight that hit it. On the other hand, if Earth was completely covered by a dark green forest canopy, its albedo would be about 0.14, meaning most of the sunlight would get absorbed and our world would be far warmer than it is today. 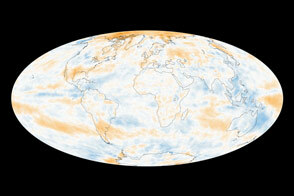 Satellite measurements made since the late 1970s estimate Earth’s average albedo to be about 0.30. In the albedo image above, white shows areas where Earth reflected the highest percentage of shortwave solar radiation. Dark blue shows areas where Earth reflected the lowest percentage of shortwave solar radiation. 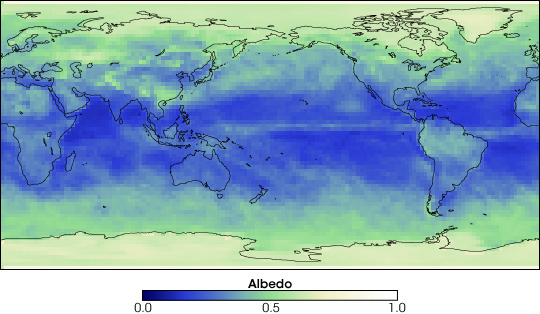 Notice how the highest albedo values are in regions where Earth is mostly covered by snow and ice, or clouds, or both. The lowest albedo values occur in forest-covered landscapes or open ocean. There are factors in Earth’s climate system that influence how much sunlight our world reflects back to space versus how much it catches and stores in the form of heat. Any significant changes in the brightness of the land surface or in the extent of clouds and aerosols in the atmosphere affect how much sunlight Earth reflects, which, in turn, affects the climate system. A drop of as little as 0.01 in Earth’s albedo would have a major warming influence on climate—roughly equal to the effect of doubling the amount of carbon dioxide in the atmosphere, which would cause Earth to retain an additional 3.4 watts of energy for every square meter of surface area. In the May 6, 2005, issue of the journal Science, the CERES Science Team reported Earth’s shortwave albedo has been steadily declining since the Terra CERES instrument began making the measurement in February 2000. Over the 4-year span (2000 through 2004), the CERES instrument measured an albedo decrease of 0.0027, which equals 0.9 watt of energy per square meter retained in the Earth system. The CERES Team is currently unsure what caused this decline in albedo. The team says future research will focus on comparing CERES data to data from other space-based sensors to see if there are any significant changes in Earth’s climate system during that time that could account for the change in albedo.